Sixteen talented Assyrian artists from across the United States entered a total of thirty-nine pieces in the AUAF’s first annual art competition. Judging for the competition was conducted by Chicago-area artists Tim Anderson, Evelina Mayner, and Hannah Hummel. Our panel was asked to consider and score each piece individually in a series of rounds. Only five artworks could be chosen from the thirty-nine entries as finalists. The judges remarked on the exceptional quality of the work and the difficult task of choosing only five pieces. The process of narrowing down our applicant pool was a challenging one for our judges, as it was composed of so many impressive and diverse pieces. Ultimately, five pieces were selected to advance to the final round. Congratulations to the winners of the AUAF’s 2017 Art Competition! These exceptional artworks are now on display in the Studio Gallery. A portrait of an Assyrian woman dressed in traditional Assyrian folk costume. The piece captures the spirit of Assyrian culture and heritage. John Malk is an Assyrian artist known for his realistic sketches and portraits. Using graphite pencils and charcoal, Malk has been drawing powerful pieces for years. A native to Syria, Malk’s work is inspired by people from ancient Assyria to modern Syria. He studied art in Damascus, later continuing his education in Poland. In 1992, he resettled in Chicago where continues to create magnificent pieces, capturing the Assyrian spirit in many of his works. His attention to detail brings his portraits to life. Malk believes that art is one of the most effective ways to both document Assyrian history and share Assyrian heritage with the world. 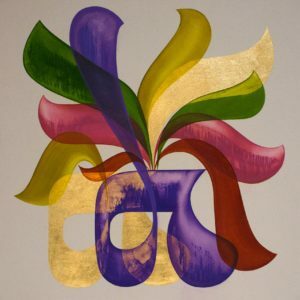 The first painting in Givarkes’s Assyrian Calligraphy series, the piece was inspired by the Assyrian lotus flower design and combines the Assyrian letter tav with the flower. Givarkes’s unique approach to calligraphy incorporated vibrant colors, straying from the sole use of black in traditional calligraphic works. Born in Urmia, Atra Givarkes is currently based in California. After graduating from high school, Atra attended Tabriz Azad University in Iran, studying graphic design. One year into her education, she relocated to the United States and continued her studies at Modesto Junior College, completing an Associate Degree in Fine Arts. She then transferred to the University of California San Diego, obtaining a Bachelors Degree in Visual Arts in 2016. While attending college, she worked as a volunteer curator for the university’s art gallery, and participated in many student exhibitions. Her pieces and drawings are comprised of calligraphic compositions that reflect both her memories and her identity as an Assyrian. 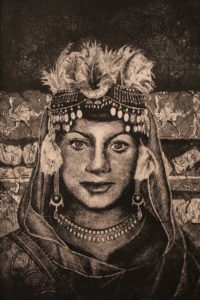 A portrait of an old Assyrian woman created using charcoal art. 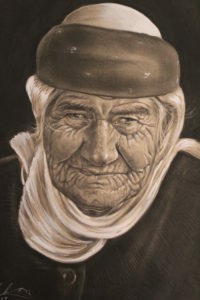 The piece was drawn from a photograph of an elderly woman taken by the artist. It captures the pain and resilience that defines the Assyrian soul. 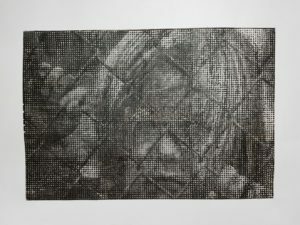 The young boy depicted behind the fence represents all Assyrian children in Iraq who live under oppression and have to overcome barriers daily and their desire to live freely as equal citizens, with the freedom and opportunities afforded to children in other parts of the world. Noryana Kazzo is a nineteen year-old artist from Iraq. Her family fled persecution in Iraq, resettling in Syria, where she spent her childhood. She discovered her love for art at the age of ten. She is a self-taught artist, who credits her father as one of her teachers. She did not have the opportunity to formally study art in Syria. After fleeing the war in Syria, Noryana and her family resettled in the United States, where she would take her very first art class. 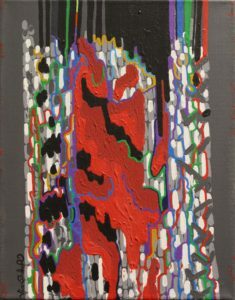 She continues to evolve as an artist, and hopes to study art after graduating from high school this spring. This piece represents the horrors of gang violence in Chicago, depicting the residual blood left from the violence that plagued spring, summer, and fall in the wintertime. The white and grey rectangles symbolize rival gangs. The different color lines represent the arteries of innocent victims, each with their own story. Victoria Akhteebo is a Chicago-based artist who began her artistic journey at the age of eight drawing jewelry and fashion designs. She later developed an interest in graffiti art, and studied the craft independently, initially by recreating popular graffiti pieces for practice until she developed her own personal style. Akhteebo hopes her artwork will push viewers out of their comfort zone, not only through her style of work, but by depicting subjects that are often considered controversial. Her work presents a critical view of life and prompts the viewer to question their own perspective on some of society’s toughest questions.